Globally, a Churchill Fellowship is highly regarded as it provides a pathway for Fellows to access industry leaders from across the world, enabling the exchange of knowledge, technology and experiencee enrichment of Australian society. The Winston Churchill Memorial Trust was established in 1965 after the death of former British Prime Minister, Sir Winston Churchill. Its main objective is to perpetuate and honour the memory of Sir Winston by awarding Memorial Fellowships, also known as ‘Churchill Fellowships,’ to ordinary Australians with extraordinary abilities and aspirations. The Churchill Fellowship aims to provide these Australians with an opportunity to travel overseas and conduct research in their chosen area of study that is not readily available in Australia. It also aims to reward proven achievement of talented and deserving Australians with further opportunity in their pursuit of excellence, new ideas and innovation. What does it mean for CREATE? CREATE Foundation CEO, Jacqui Reed, was awarded a 2014 Churchill Fellowship with the purpose of studying the improvement of life outcomes for young people transitioning from statutory care to independence – Netherlands, France, UK. Transitioning from care to independence for care leavers is a journey not a destination. This project aims to discover the contributing factors in order to understand and mitigate the barriers that impact on successful post-care outcomes for young people. Interviews will occur with policy makers, workers and young people who have “lived experience” of the care system. A report utilising case studies with recommendations will be developed to inform Australian best practice and support young people transitioning from care. 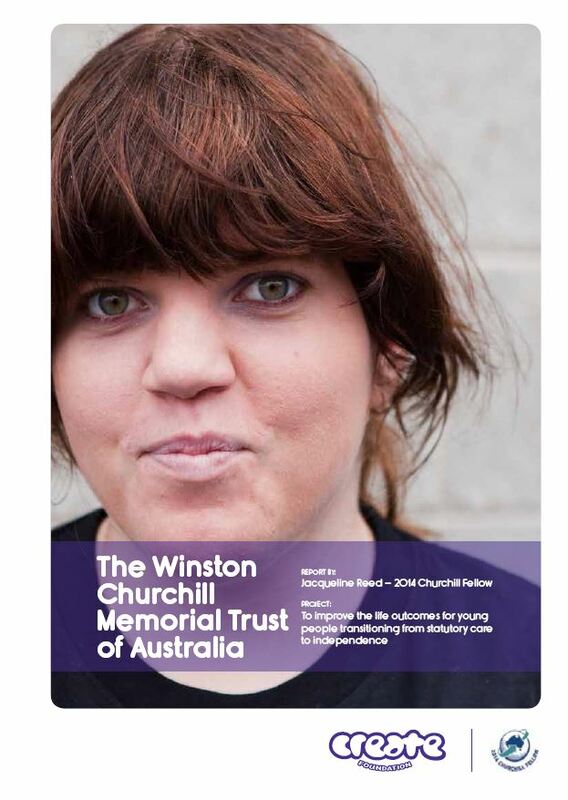 CREATE Foundation would like to congratulate Jacqui on receiving this extraordinary fellowship and extend its gratitude to the Winston Churchill Memorial Trust for this incredible opportunity to CREATE a better life for children and young people in out-of-home care. PROJECT: To improve the life outcomes for young people transitioning from statutory care to independence.